Apparently my yard has been designated the new Upland Game Bird Sanctuary for the Greater Mat-Su Metropolitan area. It is open 24/7 and includes grassy areas, alaskan dead falls, grass that is getting over run with clovers, some snow, fireweed, and a nice deck. For your viewing pleasure, a sampling of two of the six pheasants that have moved into the sanctuary. 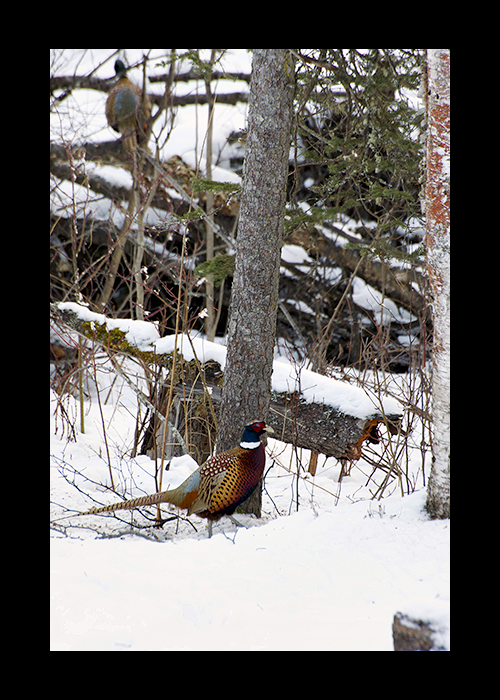 This entry was posted on Wednesday, March 24th, 2010 at 1:39 pm	and is filed under Uncategorized and tagged with alaska pheasants, pheasants, Upland game birds. You can follow any responses to this entry through the RSS 2.0 feed.